Melia Robinson for Business Insider: Around 8 p.m. on a recent night outside the offices of Knightscope, a robotics startup based in the heart of Silicon Valley, a middle-aged man allegedly toppled a five-foot tall, 300-pound robot to the ground. 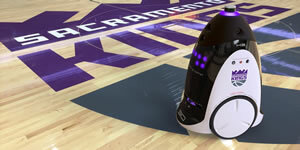 The security robot, called K5, had been circling the front parking lot on patrol, as it does every day. After the attack, the machine — which looks like the love child of R2-D2 and a Dalek from "Doctor Who" — sounded an alarm and alerted employees inside to the incident. Knightscope employees detained the man and called the police. The man, who police said smelled strongly of alcohol, has since been arrested on prowling and public intoxication charges. K5 is happily back at work. Bill Santana Li, CEO of Knightscope, tells Business Insider there's a lesson to be learned from the events on April 19. "Don't mess with a K5," Li says.